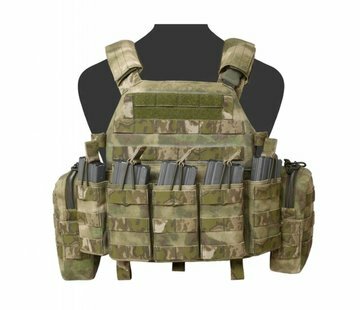 Warrior Assault Systems DCS Base Plate Carrier in A-TACS AU. The DCS (Dynamic Combat System) is a lightweight armour carrier, with removable sides. Can hold Nexus Soft Armour Front and Back and in adjustable side pouches,is also capable of holding large ballistic plates front and back, and 6 x 8 side plates. The DCS can be be worn in tandem with the Warrior Frag Belt (sold separately).